There are less than two months left for Army Acquisition Workforce (AAW) professionals to complete the requirement for 80 Continuous Learning Points (CLPs) in a two-year cycle. The deadline is Sept. 30. If you have any questions, please ask your supervisor or your organizational acquisition point of contact (OAP). The Army DACM Office is responsible for tracking and reporting compliance to the Office of the Undersecretary of Defense for Acquisition, Technology and Logistics (USD(AT&L)). Failure to complete CLPs during the two-year cycle can affect your ability to qualify for Army DACM Office acquisition career development opportunities. While we’re on the topic of mandatory certifications, did you know that every AAW member must complete and track ethics training every year? This annual requirement is mandated for the Defense Acquisition Workforce. In a July 23, 2014, memo, Lt. Gen. Michael E. Williamson, Army DACM, indicated that he expects 100 percent compliance. 1. Take one of the two online courses available through the iCatalog. The available courses are CLM 003 (Overview of Acquisition Ethics) and HBS 415 (Ethics at Work). NOTE: You can get credit for CLM 003 only once in a two-year CLP cycle, which runs from Oct. 1, 2014, to Sept. 30, 2016. 2. Take the course in person when your command or garrison offers it. Contact your training coordinator or your ethics officer if you are unsure when your local training will be offered. Once your annual ethics training is complete, you must properly list the course as completed on your individual development plan (IDP) within CAPPMIS and obtain supervisor concurrence. NOTE: AAW members who use the Training, Education & Development System (TEDS) must follow the ethics training implementation guidelines (Last page on the above-referenced DACM memo) to determine how to list your training properly to ensure that it flows into the CAPPMIS IDP. The Army DACM Office is responsible for reporting compliance to the USD(AT&L). Command representatives (acquisition career management advocates and OAPs) are responsible for ensuring command and program executive office compliance. As an acquisition professional, you are responsible for meeting this requirement. 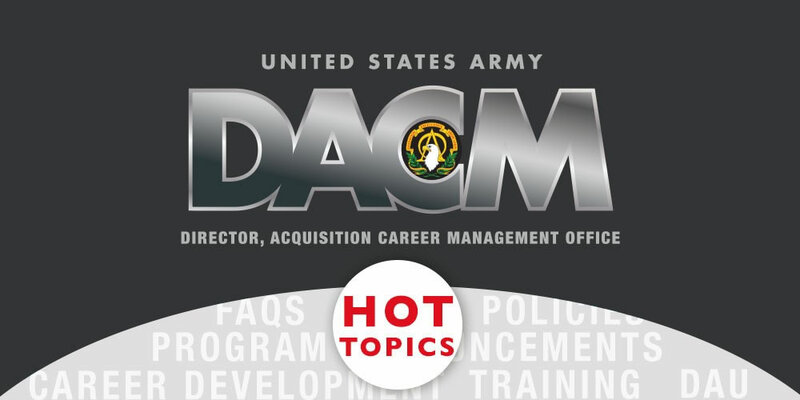 The July DACM Newsletter was posted on the Army DACM Office website on July 13. Included in this issue are articles on the Competitive Development Group/Army Acquisition Fellowship (CDG/AAF) program and the Defense Acquisition University Senior Service College program, as well as information about the Army DACM Office policy webpage. The announcement for the CDG/AAF program is currently open and will close on Sept. 28. The First Quarter (FY17) Announcement for the Acquisition Leadership Challenge Program is open Aug. 1-31. This is an excellent leadership development seminar series offers three different courses for AAW members at GS-7 through GS-15. Visit the program page for further details. The application window opens this month for Army Acquisition Centralized Selection List positions for lieutenant colonels/GS-14s and colonels/GS-15s. Visit the program page for more information. The Defense Acquisition University (DAU) has announced several new and revised DAU courses. Students interested in the offerings may apply in ATRRS Internet Training Application System (AITAS). ACQ 165 – Defense Acquisition of Services. ACQ 165 is a new distance learning/rolling admission web course. This course is based on DOD Instruction 5000.74, Defense Acquisition of Services, and includes services acquisition roles and responsibilities; oversight and approval of contracted services portfolios; requirements development, validation and oversight; data collection, reporting and inventory of contracted services; and acquisition considerations for information technology (IT) services, including IT as a service. ACQ 165 is designed for individuals who need to improve their knowledge of developing and defining service requirements, supporting business strategies, coordinating review and approval of services contracts, and effectively managing the resulting contractor performance. The course also may serve as an opportunity for experienced acquisition personnel to improve their understanding of the service acquisition process, approval levels and reporting requirements. Target audience: All service acquisition team members, including contracting officer representatives, quality assurance reviewers, contracting specialists, as well as those involved in developing and executing performance requirements and business strategies, and assessing contractor-provided services. BCF 131 – Applied Cost Analysis. This course, which replaces BCF 107, enables students to apply the techniques learned in BCF 130 to develop cost estimates with an emphasis on life cycle cost estimates. Learning methodologies include interactive presentations, group discussions, cost analysis using MS Excel, and case study of an ongoing major defense acquisition program. The course will expose students to current developments in data collection and software cost estimating. The course is in the process of being piloted, and students interested in the pilot offering may apply to offering #001, held Nov. 14-18. LOG 235 Performance – Based Logistics. This course is being updated, and the student pilot will be conducted online. To obtain commitment from students interested in participating in this pilot class, students who register between now and Aug. 4 will be placed on a waitlist. Students will then receive an email from scheduling@dau.mil, letting them know whether they will be able to participate in the pilot class. Those who are willing to participate will be enrolled in LOG 235, Class 951, which will begin on Aug. 8. Students who do not wish to participate in the pilot will be enrolled in a regular section no later than Aug. 5.